Infinity is a difficult concept to grasp, but it is easy to contemplate when you step inside one of artist Yayoi Kusama’s iconic Infinity Mirror Rooms in the new exhibition Yayoi Kusama: Infinity Mirrors. This major exhibition examines the contemporary Japanese artist’s significant 65-year career and contextualizes the notion of infinite expansion and accumulation in her work, culminating in her visually stunning Infinity Mirror Rooms. Visitors can immerse themselves in five of these kaleidoscopic environments where the viewer is endlessly reflected within fantastic landscapes—alongside examples from the artist’s beginnings: her mesmerizing and intimate drawings, her early Infinity Net paintings which grow on a canvas like cell formations, and her surreal sculptural objects covered with strange growth formations. These key works join more than 90 works on view, including large and vibrant paintings, sculpture, works on paper, as well as rare archival materials. The 87-year-old artist continues to work at a brisk pace in her Tokyo studio. The exhibition features the North American debut of numerous new works. Her most recent painting series, My Eternal Soul (2009–present), may be the greatest surprise. Exuberant in color and paired with sculptures that bear titles such as My Adolescence in Bloom, they mark a striking progression in the use of Kusama’s signature symbol of the polka dot. Also in the US for the first time is the recently realized Infinity Mirror Room, All the Eternal Love I Have for the Pumpkins, 2016, a field of yellow, dotted pumpkins spreading into infinity. The 1960s were a crucial time for Kusama’s creative development. 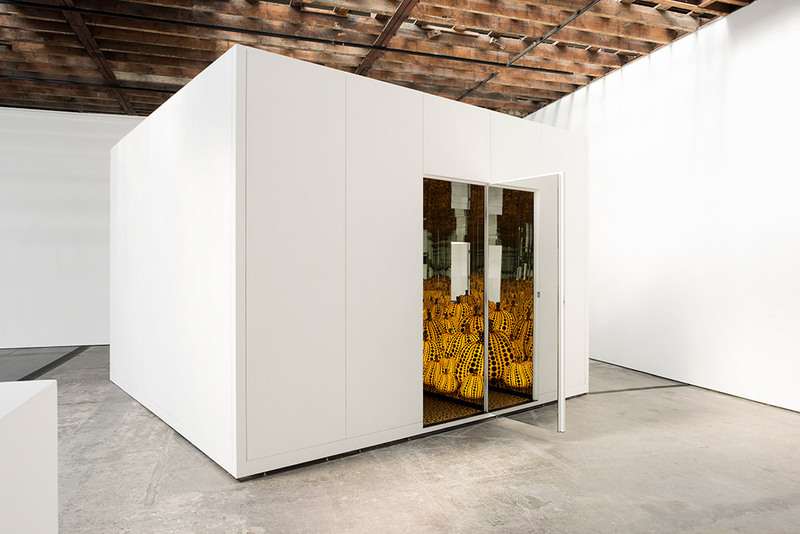 She was invited to show with the German Zero group, which had an interest in participatory installations. She embraced performance in her photographic documentation and began producing films and staging Anatomic Explosions, collective happenings in New York City where she took up residence in the late 1950s. Central to the exhibition is a recreation of Kusama’s original 1965, Infinity Mirror Room—Phalli’s Field, in which she displays a vast field of polka-dot covered, white tubers in a room lined with mirrors. This room merges Kusama’s Accumulations, which had previously existed as sculptural objects, into the illusion of an infinite space. In a radical move that connects to participatory art, Kusama created The Obliteration Room in 2002. Kusama provides a white domestic interior of sofas, tables, chairs, and everyday objects and visitors are invited to complete the work. Kusama’s concept of obliteration finds new expression as the pristine white room is gradually covered in an accumulation of brightly colored dots, with the intention that the installation will transform during the run of the exhibition. In addition to the paintings, sculptures, drawings, and environments, viewers will encounter posters, letters, cards, and invitations that relate to Kusama’s early exhibitions and events—including her first solo show which took place in Seattle—a slideshow of Kusama’s performances as well as a video interview with the artist filmed on the occasion of this exhibition. The exhibition was organized by the Hirshhorn Museum and Sculpture Garden, where the exhibition premiered, and was curated by Mika Yoshitake. The exhibition will be on view at the Seattle Art Museum June 30–September 10, 2017, before traveling to other major museums in the United States and Canada, including The Broad in Los Angeles (October 2017–January 2018), the Art Gallery of Ontario (March–May 2018), the Cleveland Museum of Art (July–September 2018), and the High Museum of Art (November 2018-February 2019). Yayoi Kusama: Infinity Mirrors is organized by the Hirshhorn Museum and Sculpture Garden, Smithsonian Institution. Guided by her unique vision and unparalleled creativity, critically acclaimed artist Yayoi Kusama has been breaking new ground for more than six decades. In 1993, she became the first woman to represent Japan at the Venice Biennale, and last year, Time magazine named her one of the world’s most influential people. 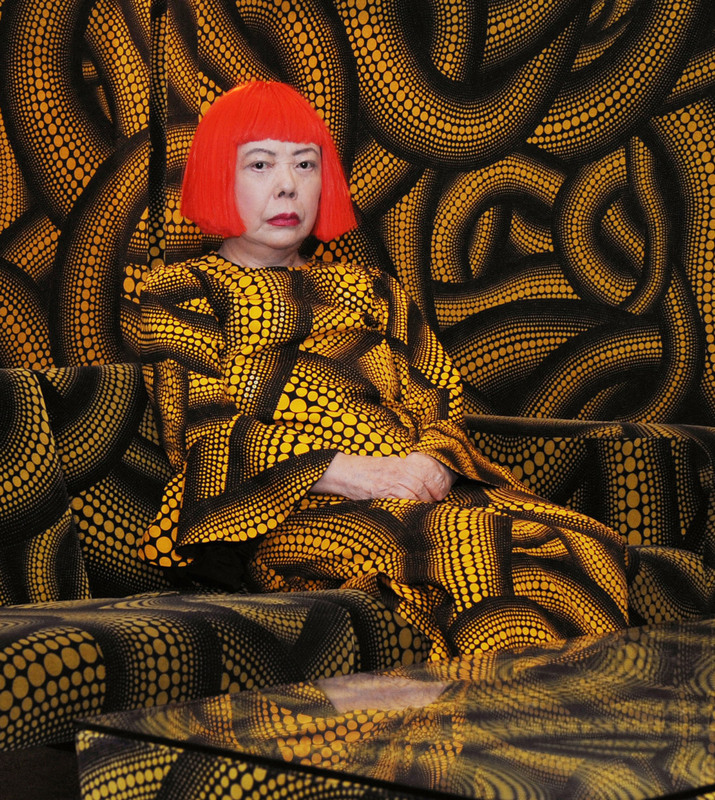 Born in 1929, Kusama grew up near her family’s plant nursery in Matsumoto, Japan. At nineteen, following World War II, she went to Kyoto to study the traditional Japanese style of painting known as Nihonga. During this time, she began experimenting with abstraction, but it was not until she arrived in the United States, in 1957, that her career took off. Living in New York from 1958 to 1973, Kusama moved in avant-garde circles with such figures as Andy Warhol and Allan Kaprow while honing her signature dot and net motifs, developing soft sculpture, creating installation-based works, and staging Happenings (performance-based events). She first used mirrors as a multireflective device in Infinity Mirror Room—Phalli’s Field, 1965, transforming the intense repetition that marked some of her earlier works into an immersive experience. Kusama returned to Japan in 1973 but has continued to develop her mirrored installations, and over the years, she has attained cult status, not only as an artist, but as a novelist. Images: Infinity Mirrored Room—All the Eternal Love I Have for the Pumpkins, (exterior view) 2016, Yayoi Kusama, Japanese, b. 1929, wood, mirror, plastic, black glass, LED, Collection of the artist, Courtesy of Ota Fine Arts, Tokyo/Singapore and Victoria Miro, London, © YAYOI KUSAMA. Kusama in Living Room/YELLOW TREE at YAYOI KUSAMA furniture by graf, graf studio, Osaka (detail), 2002, Courtesy of the artist, © YAYOI KUSAMA.